Gareth Southgate’s England side head into the final warm-up games against Nigeria and Costa Rica hoping to further improve the atmosphere in the squad ahead of the World Cup finals, and they have been made hot favourites to win the clash at Wembley Stadium. Nigeria, on the other hand, have had mixed success of late, but they, too, booked a ticket to Russia, even though many believe the Super Eagles will crash out in the group stage. Therefore, you should know that new Betfair players signing up through this link are quoted 25/1 price on home win. 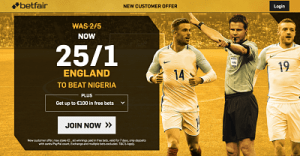 New Customers can get England at an enhanced 25/1 all to beat Nigeria. Max Stake £1. Winnings paid in free bets, valid for 7 days, only deposits with cards/Paypal count. Exchange and multiple bets excluded. T&C’s Apply. 18+|Gamble Aware.